We all live somewhere; whether it be a town, village, or city; urban or rural, small town or giant metropolis. What makes it home though is a sense of community. Men like Rufus Pinkney are what makes a community. You don’t know who Rufus Pinkney was? Well you must not have lived in DeLand, Florida at any time for the past sixty odd years. Rufus was an institution in the downtown area. Even if you didn’t know his name you knew who he was. He was a local legend. Was he a sports star? Was he a political figure or a prominent banker or lawyer? No. Mr. Pinkney shined shoes. That’s right. He shined shoes and he was a more beloved representative of small town community than any sports star could be. Rufus was born June 12, 1932 in Palatka to parents Pearl and Rufus Pinkney. As a child the family moved to Miami before Rufus left south Florida, ending up in Mississippi where he met his future wife, Mary Louise Gray. Rufus and Mary had two children; a daughter Sharon and a son, also named Rufus. Pinkney operated his shoe shine business out of a small building located in the parking lot near 127 E. New York Avenue. Here, according to a Daytona Beach News-Journal article “…is a jumble of polishes, brushes, calendars, shelves of gleaming shoes, and more signs. One praises him as the “Master Engineer in Charge of Preserving the Primary Means of Personal Locomotion,’ and a bulletin board [was] thickly thumbtacked with business cards.” His shop was most recently adorned with a sign painted by Stephen Danko showing an alligator shoe with the words “Shoes Shined by Rufus”. Mark Lane of the News-Journal reports that Pinkney had shined shoes in Deland since 1955 and before that in St. Augustine at the old railroad station. In addition to his skill at shining shoes, Rufus was a well-known local harmonica player and received the gift of being a great conversationalist. He was an elder at Greater Refuge Church of Our Lord Jesus Christ. When you saw him he was always dressed well and of course his shoes were never scuffed. Rufus passed away September 12, 2016 after suffering a stroke. In his 84 years though he touched many lives. Personally, I can remember Rufus from back in the late 1980’s and early 90’s when I worked in downtown DeLand. He used to always stop in for his daily coffee. Sometimes more than once a day would we see him. He never really lingered long though he was always pleasant and had a smile and kind word for everyone. He couldn’t linger because he was busy. He had to get back to the shop and take care of business. Recently the City of DeLand unveiled a mural in Mr. Pinkey’s honor near where his popular shoe shine stand used to be. It is only fitting that he be remembered in this way. Please read more about the mural unveiling and see several photos here. Since 1965 Daytona Beach has served as home to one of only six, twenty foot fiberglass Jantzen Girl statues. The statue/sign was a fixture outside of Stamie’s Smart Beach Wear since arriving from Miami. That all changed recently when the store located along the recently renovated boardwalk area closed with the retirement of second generation owner Irene Koutouzis. The sign was never owned by the Koutouzis family but rather was still owned by Jantzen who has taken possession of the landmark piece with an apparent goal of rehoming it. The relocation will come with a price. Despite a complete makeover in 2004 and regular coats of wax, recent hurricanes and the realities of being near the ocean will require over $10,000 worth of work according to building owner Louie Louizes. Jantzen was formed in 1910 by co-owners John A. Zehntbauer and Carl C. Jantzen and was known as the Portland Knitting Co. By 1913 they were crafting bathing suits for the Portland Rowing Club and in 1918 the company name was changed to Jantzen Knitting Mills. With business expanding in the 1920s a national marketing gimmick was needed. In stepped artists Frank and Florenz Clark who became inspired by Olympic tryouts for the 1920 women’s dive team. The red clad diving girl was born! Throughout the years the image has evolved and in 1959 six of the fiberglass sculptures were created by a Los Angeles mannequin company, of which four are known to still be in existence. I am assuming two are in possession of Jantzen after having been in other, now closed, locations. A third is used for promotional displays in various stores selling Jantzen products. The Daytona Beach Jantzen girl, the last to be on display in a regular home, is currently in Washington state where the statue is receiving a complete restoration while plans for its future are decided. Will that future include Daytona Beach? Maybe. Jantzen is currently weighing its options but is closely following the groundswell of support that Daytona Beach residents and visitors are showing. Support such as that shown at a new Facebook page “Bring Back the Jantzen Girl” can do nothing but help. And if by chance the statue goes elsewhere a page like this is a great historical record. If you have photos or memories of the Jantzen Girl please feel free to share them here in the comments section. Perry Ellis International is the owner of Jantzen, having acquired the company in 2001. Lees, William B. and Frederick P. Gaske. Recalling Deeds Immortal: Florida Monuments to the Civil War . Gainesville: University Press of Florida. 2014. 370 pages, 305 pages text. Index, bibliography, end notes, b/w photos. ISBN 9780813049960, $44.95. With the recent controversies over monuments and memorials, and not just those with some attachment to the Civil War as a whole or the Confederacy specifically, it can be easy to lose sight where monuments are, who or what the were erected to or for, who erected them, or in some unfortunate cases, what they even looked like. Authors William B. Lees and Frederick P. Gaske have done a fine job in rounding up and researching Civil War monuments located in the Sunshine State. Lees and Gaske are well qualified to write such a book. Lees serves as Director of Florida Public Archaeology Network at the University of West Florida and Gaske has served as the state of Florida’s Historic Preservation Officer in addition to having coauthored the Florida Civil War Heritage Trail Guide, a free publication produced by the state. The authors argue that to truly understand these monuments we must place them in the context of the time they were erected. Different monuments mean different things. It is also important that we understand that sacrifice meant different things to Union and Confederate soldiers. The book is broken down chronologically which while it has its benefits, particularly in backing the author’s argument of understanding monuments and their place in time, also can become difficult for the reader if they are only looking to know about particular monuments. For those readers a straight alphabetical system would be a better choice. Readers searching for information on a favorite monument have to refer to the index to find where to turn. The book is broken into five chapters: Reconstruction and Beyond, Remembering Confederate Sacrifice and Valor After Reconstruction, Remembering the Union Soldier and Sailor, Remembering Hallowed Ground, and Monuments Erected After the Civil War Centennial. The authors take each monument and work to tell its story through the use of contemporary sources, whether they be newspapers, archives, government records, and more. A look at the notes and bibliography of this book will show the research efforts that were expended. While the Reconstruction period saw only a small handful of monuments erected, the ending of federal occupation was a boom period for remembering and honoring the dead. With the creation of the Daughters of the Confederacy and their later incarnation as United Daughters of the Confederacy at least 34 monuments were erected in the state. The subject matter and location of monuments varied from outright Lost Cause to monuments such as that in a Deland cemetery which contained a list of Confederate soldiers buried there. While the majority of these monuments are still in place some, such as the Daytona Beach monument, have been damaged or altered, and some, such as Orlando, have been removed since publication of this book. What is fascinating is the continued creation and placing of memorials and monuments. In the post 1968 period Lees and Gaske account for 33 new monuments with more being erected today. This growth is provided by organizations such as Sons of Confederate Veterans who have this as one of their stated goals. The trend on these new monuments is toward smaller and less elaborate design which is probably due to design trends but more likely cost and budget concerns. While these new monuments are often meant to commemorate hallowed ground or to honor specific soldiers the fact that the Confederate flag has been used by many other groups, often with negative consequences, the claim of “heritage not hate” is a message that is often considered to be false. This is a valuable book and should be on the shelves of those interested in Civil War history, Florida history, and even Civil Rights history. The story is an important one and one that will not be going away. It is our responsibility to understand those of the past did not live by our standards of today. To argue that the war was not based upon the issue of slavery would fly in the face of the Articles of Secession; to erase reminders of the war will not erase the war and to me is not the correct way to deal with the issue. We should not be standing in judgement of those who came before us for erecting these memorials and monuments, but rather, we should convey that history and work to tell a new full sided and complete story. To those putting up new monuments, you have a responsibility to be honest and not hide what we now understand to be true. To see other posts dealing with the University Press of Florida click here. Mills, Charles A. Civil War Graves of Northern Virginia (Images of America). Charleston: Arcadia Publishing. 2017. 128 pages, ISBN 9781467124225, $21.99. The grounds of Virginia practically ran red with the blood of the Civil War. With bloody battles such as The Wilderness, Spotsylvania, Manassas I and II, Chancellorsville, and dozens more, thousands of men lost their lives in the Old Dominion. Even more were injured, many to a level they never returned to a normal life. In his introduction author Charles A. Mills estimates there are more than 1,000 cemeteries in northern Virginia. Using this as a baseline it is easy to see that a book of only 128 pages can only scratch the surface. Once mammoth cemeteries such as Arlington National Cemetery are taken into account that lessens even further the inclusion of smaller and lesser known cemeteries. Mills relies on two sources for images in the book; his own images and those from the Library of Congress collection. Unfortunately this leads to some images being relatively already well known and then the problem with inconsistent quality of author taken photos. An example is shown on page 70; two images of stones from Falls Church both of which could have been taken at a different time of day and had better results. Library of Congress images often contain standard photos of generals and other war era scenes. I also noted a few issues throughout the text that could have been remedied. On page 18 Mills uses the number 600,000 in regards to Civil War combatant and non-combatant deaths. Recent scholarship has placed that number to be around 750,000, a number that has been gaining much more acceptance. On page 111 a photo of Abner Doubleday recounts the story of his being the inventor of baseball. A short line then attempts to throw doubt on that story; “an honor that some contest.” A review of one of the leading baseball statistical websites disproves the baseball story and it would have been better left out. These qualms aside I did enjoy this book and made fast work of it. There are some fascinating stories included and while there were more non-cemetery photos than I would have preferred in many instances it was important to the story to show background history. I particularly enjoyed seeing church cemeteries such as Pohick Church, the parish church of George Washington. Anybody with an interest in cemeteries can not help but be moved by Arlington National Cemetery and Mills does a fine job representing both historical and modern images of perhaps the greatest cemetery in the United States. For those with an interest in cemeteries this is a book that should be added to your collection. If you are interested in Civil War memory this is one you might consider thumbing through though it will probably not end up on your bookshelf. For the average Civil War enthusiast this is a book well worth including in your library despite the reservations mentioned above. The photos are well worth the overall minor quibbles I had regarding text. Thanks to Arcadia Publishing for providing a complimentary review copy. The Saint Augustine Historical Society invites you to attend the unveiling of the historic marker “ST AUGUSTINE ON ANASTASIA ISLAND” on September 8, 2016, at 11:00 A.M. in the open field (overflow parking lot) just north of the St. Augustine Alligator Farm (999 Anastasia Boulevard). Through the generosity of the Alligator Farm and Mr. David Drysdale, the Society is able to place this marker in a highly visible and easily accessed location. St. Augustine, the oldest European-settled city in the United States, was located on Anastasia Island from 1566 until 1572. Spanish settlers had founded the city on the west shore of the Matanzas River on Sept. 8, 1565. They built homes and a fort. The fort and the supplies inside burned. On May 18, 1566, a council voted to relocate the city to the barrier island across from the first location. St. Augustine moved to the barrier island for protection from hostile Native Americans and European enemies entering the port. Documents describe in detail the city’s 6-year presence on the island–two forts, government buildings, barracks, a jail, homes, wells and fields for crops. No physical evidence has yet been found. Quarrying in the 17th and 18th centuries and erosion probably destroyed the remnants of the city on the island. Sixteenth-century reports note that the island city was two leagues (5-6 miles) from a strong house on San Julian Creek, placing the city in this general area of high ground and near the 16th-century inlet. The relentless ocean eroded the town’s location. In 1572 St. Augustine returned to the mainland. Frederick Douglass, Courtesy Library of Congress. Frederick Douglass was born in 1818 and died on February 20, 1895. 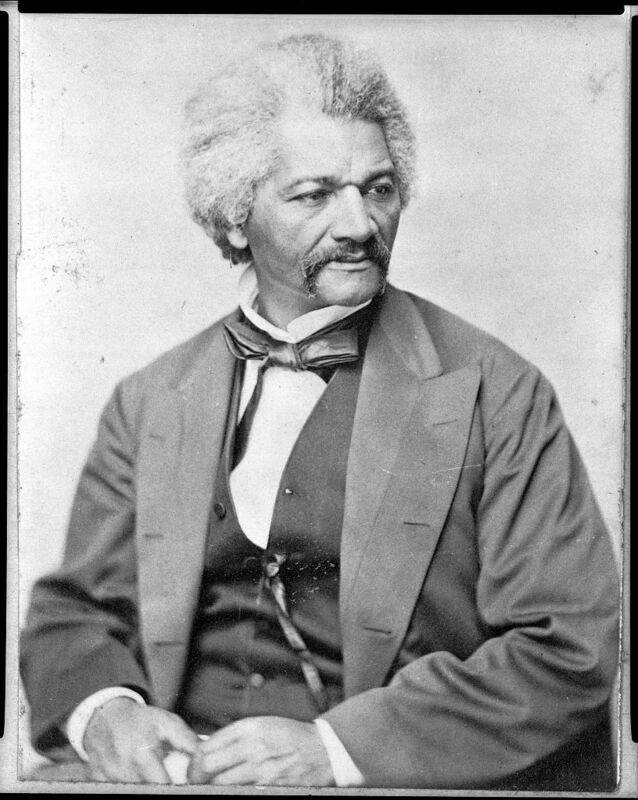 My connection to Douglass is through my research for my book ST. AUGUSTINE & THE CIVIL WAR (Civil War Series) . It turns out Douglass, who had personally met with Abraham Lincoln on several occasions, gave a speech in St. Augustine in August 1889. 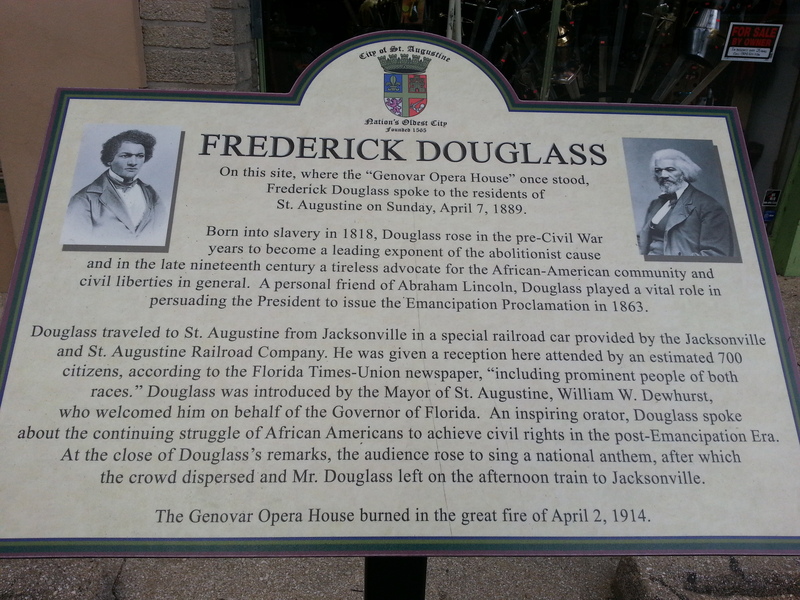 Douglass was visiting nearby Jacksonville to give a speech at the Sub-Tropical Exhibition. Douglass was convinced to take a train ride and speak in the nearby city. He was given an afternoon reception at the Genovar Opera House located on St. George Street. He later spoke to a racially mixed audience of approximately 700. His speech was an abbreviated version of his Jacksonville lecture. The Frederick Douglass Monument located in St. Augustine. Courtesy Robert Redd. the ground in April 1914. 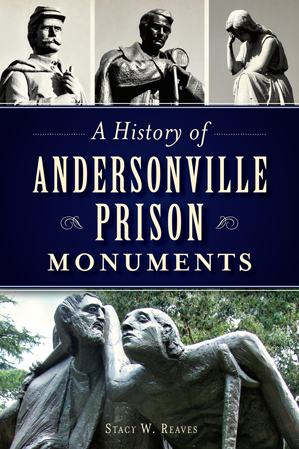 A History of Andersonville Prison Monuments cover. Reaves, Stacy W. A History of Andersonville Prison Monuments (Civil War Series). Charleston, Arcadia/History Press. 2015. ISBN 9781626196247. 139 pages, 132 pages text. $19.99. Index, bibliography, b/w photos. Prisoner of war camps are never a pleasant place. Those that Union and Confederate soldiers endured during the Civil War were horrific. Death rates were exceedingly high. This is due to several factors; lack of food, lack of medical care, an uncaring attitude from those in charge, poor hygienic condition and others were most common. Who is to blame for these conditions if often debated with no clear answer ever agreed upon. When Civil War prisons are thought of I would venture that the name Andersonville would be the most commonly mentioned. While no doubt the most famous, or infamous as the case may be, it was hardly the only one with deplorable conditions. The fact that it held Union prisoners and that its commandant, Henry Wirz, was put to death for his actions, and perhaps the fact that the grounds are still available to visit have led to the prison’s notoriety. Author Stacy W. Reaves has written a book discussing the memorials and monuments that have been placed around Andersonville. The book is broken into three major themes: the founding of the prison and what it was like, efforts to preserve the land and tell the story of what happened there (of primary importance is the Women’s Relief Corps who at one time owned the majority of the prison property), and finally efforts from various northern states to erect monuments to their lost men. The majority of the book, approximately 90 pages, deals with individual monuments and the efforts made by various state agencies and groups to have them placed. While the majority of photos are modern there are some excellent photos of veterans gathered at monuments which helps bring a real sense of humanity to the book. 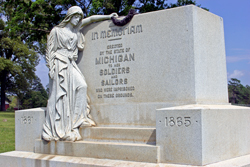 Michigan monument at Andersonville, dedicated in 1904. Courtesy National Park Service. My personal favorite in the book is the Michigan memorial. This monument, which cost approximately $6,000, shows a mourning Columbia bringing a laurel victory wreath to place on the graves of the dead from Michigan. It is a monument that is different from the majority of those seen and it looks to be beautifully carved. While there are several statements included putting down the southern efforts while failing to acknowledge northern prison problems (page 14) it is important to note the inclusion of information on the Wirz monument. This monument, erected by the United Daughters of the Confederacy in 1909, is not located within the park service boundaries but rather in the town of Andersonville. While not a complete look at all monuments this is certainly a book that anybody interested in Andersonville, Civil War prisons, Civil War memory, or cemetery iconography should take a look at. The text is brief, only 139 total pages with plenty of photos, and can be read through in an afternoon. Thank you to The History Press for sending a complimentary review copy. 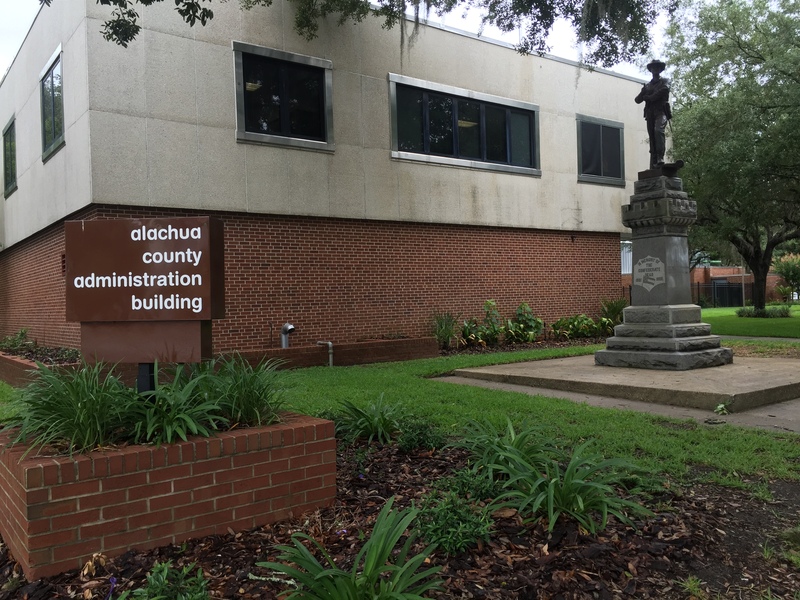 In the seemingly unending assault on anything Confederate, the Alachua County Commission has agreed to move the Confederate monument located at in downtown Gainesville to the Matheson History Museum. As it always seems this issue has brought out all kinds of people from both sides wishing to voice their opinion. The funny thing, a year ago how many of them even knew the monument was there and if they knew, did they care. Read about the move in the local paper here.